You can manage your money on the go, whenever and wherever you want. Rapid changes in technology – including apps on your smartphone and software you can use at home – have made now the easiest time to control your finances. But a recent CreditDonkey.com survey found that most people underuse money-management tools. Out of more than 1,100 respondents, 72.8% said they do not use a smartphone or tablet app to manage their money. This is the despite the fact that financial institutions are coming out with new apps practically every day that lets people check their balances or even transfer funds between friends. 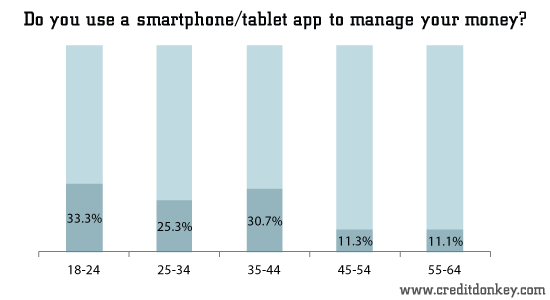 Only 27.2% answered that they do use apps for financial management. Our findings on mobile wallet usage were similar: In a 2012 CreditDonkey.com survey, nearly 68% of smartphone owners said they do not want to replace their cash and credit cards with mobile payment apps. As one might guess, younger adults are more apt to tap apps to manage their income and expenses – our more recent survey’s largest age group of app users was the 33.3% of adults aged 18-24. Web tools are used more than smartphone apps. Perhaps those reluctant to use their phones beyond texting and playing games will come around. A much smaller amount of respondents than the non-app users – 55.8% of the total – said they do not use a website to manage their money. These Luddites are missing out. A ton of online tools and smartphone apps exist that help people track their progress in socking away savings and making sound investments. And tracking results is an important indicator for financial success, according to John C. Norcross, a psychology professor at the University of Scranton, who writes about reaching goals in his new book “Changeology.” According to Norcross, the more you track your behavior and actions, the easier you’ll be able to identify triggers and avoid pitfalls to unwanted behaviors. Similarly, you’ll be able to celebrate and reward your positive behavior along the way. The reason for reluctance? A fear of security breaches. It’s understandable when consumers are wary of giving mobile or web platforms access to their accounts if they’re not used to doing it. But regardless of whether you use paper or paperless statements, the Federal Communications Commission (FCC) recommends checking your account statements every single month for flags or erroneous charges, to fully protect yourself. Another best practice is to always keep your mobile devices password-protected – to give you a leg up against thieves who want your personal data. According to a survey conducted on behalf of Experian’s ProtectMyID, nearly 54% of consumers do not use a password to lock their phone or tablet. Share on Facebook "Survey: Money Management Statistics"